Golf / Strategy / Forget Bogeys, Play for Barbies! Professionals play for par. But that’s hard. A simple scoring trick can make it easier to keep score and make things a lot more fun. But who wants to play for bogey? There’s no way it sounds good. Well, “par” + “bogey” = “barby”. And everyone wants to play for barbies! Professionals play for par. They work 8-10 hours a day, 5 or 6 days a week. A hundred years ago, the standard was bogey. 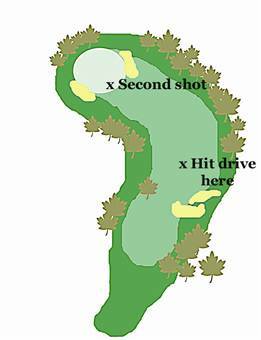 It had the same connotation that “par” does today: It was the ideal score to achieve on any given hole. That’s a reasonable goal for any reasonably assiduous weekend golfer to achieve, with today’s technology. The only thing left is to make it sound desirable. “Barbies”. Now there’s a word with acceptable connotations. Who doesn’t want to play for barbies? If you’re a girl, you can think of them as dolls. If you’re guy, you can think of them as a bevy of babes — real live dolls. Now that’s something worth playing for! I never play for “Barbie”. That’s a trademark of the Mattel Corporation, and I would never, ever, want to infringe on their turf, of misuse their trademark. Never, ever. Not in a thousand years. So I never play for “barbie”. That would be wrong. I play for “barby” (plural: “barbies”). Yup. That’s what I do. So my goal on any given hole is to figure out how I can get a barby — one of the many barbies I’ll be playing for during that round. It’s easier to keep track of your score. The top line is the invisible player I’m playing against. (Bogey, or Barby. Take your pick.) The second line is me. The third is the cumulative over/under. If fill in 1 over par for the invisible player. To get their total for the side, I add 9 to the par total. All very easy. It’s a lot less depressing to keep track of your score. If I finish a round at 5 over bogey, I can pretty easily think of 5 shots I could have played differently. Hey, next time, maybe I’ll finish under bogey! That would be terrific. How cool would be to finish in negative numbers!I came in to the 18th at one course, after playing even bogey for the round. All I needed was one more bogey for my best round ever, or with a par, I could finish in negative numbers. What a thrill! Then I massacred the hole. Went into water that wasn’t even in play. Twice! Oh well, that’s golf. But I was in the hunt! You can double check your own score. Adding up the holes should equal the over/under score. In a club tournament, I’ll always do that. But it’s also worth doing when you start scoring this way, too. It helps you find scoring mistakes until you perfect your technique. You can dream about reaching your goal of playing for barbies. And you can dream about collectiing real barbies! How motivating is that? No one else knows what you’re doing when you’re keeping score. You can confuse yourself, until you get used to it. I confess that it took me a while! It’s trickier to keep score for a group. When everyone else says “two over”, or “double”, they mean two over par. So if you’re keeping score for more than yourself, it can get confusing. (To minimize confusion, take a trick from friend Jim Holmlund who says “Give me a number!”. Pretty soon, people just do. For most of us, playing for barbies makes a lot of sense. When you’re consistently in negative double-digits (10 or more under barby), then it makes sense to keep score relative to par. Until then, play for barbies. It’s easier to keep score, the game is more fun, and you can dream of future rewards!